Pictured above, scenes from the Valentine’s Day celebrations at Rosebridge Manor and Frost Manor. 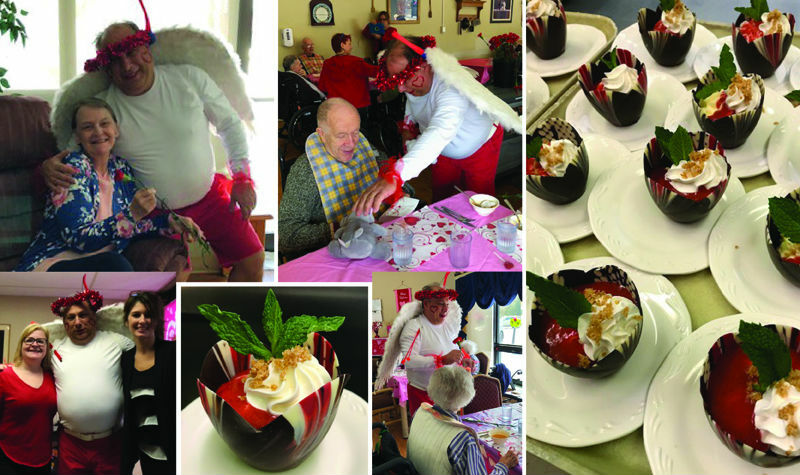 From “Cupid” handing out flowers and stuffed animals to pureed chocolate cheesecake piped into “tulips,” Rosebridge Manor made Valentine’s Day an affair to remember. The Jasper long-term care home hosted a recent luncheon featuring a special menu and the director of care’s (DOC) husband dressed as Cupid. Kori Bigelow, nutritional care manager (NCM), has been wanting to make the occasion extra-special for a few years. It all “snowballed” and came together beautifully, she tells The OMNIway. “We haven’t really gone over-and-above in the past,” Kori says. It was an effort, pulled off through teamwork, that was well-received by residents and staff alike. “One resident said ‘I didn’t think you could top Christmas but you did.” Long-time kitchen employees said it was the nicest Valentine’s Day ever for the home, the NCM notes. Managers served the meal – which consisted of baby back ribs, garlic cheddar potatoes and steamed veggies, along with the fancy tulip-shaped cheesecake dessert, to residents. Employees received a little love as well, courtesy of flowers from Cupid. “It was fun,” Kori says. Meanwhile, love was also in the air at Frost Manor on Valentine’s Day. Jesse Fraser, a life enrichment aide (LEA) at Frost Manor, says the Lindsay long-term care home held a party on Feb. 14. “We enjoyed red velvet cupcakes with our coffee and tea while we were entertained by the amazing and fun band, Dig The Moon,” Jesse says. Residents were moved to dance, sing and clap along with the music. “Everyone had an amazing time,” the LEA says. If you have a story you would like to share with The OMNIway, please contact the newsroom by e-mail at deron(at)axiomnews.com.